For some decades, many Khamer-style art works of doubtful origin have appeared on the market, most of which were made in Southeast Asia with materials identical to the original. We believe that some of these counterfeits may be revealed by a comparative study of their styles and of the iconography, which professor Jean Boisslier has so excellently described in his work La Statuaire Khmere et son evolution. In spite of this source, some assessments of the authenticity of objects are still difficult to make. For instance, how can counterfeits be identified when the sculptures are of provincial style, or in the case of images of divinities whose apparel and ornaments bear no resemblance with anything known or are stylistically very puzzling. To confirm or dissipate doubts as to the authenticity of sculpture of this type. It seemed to us necessary torpedoes an analytical test for the stone on the basis of the specimens we had available. This analysis was conducted by Mr. Bertrand Duboscq at the Micro-Analysis Research and Studies Laboratory in Pessac, using as our standard for authenticity stone samples that had become detached naturally form the Angkor temples. Our results allow us to draw some conclusion about counterfeits, and we also provide information about how artificial patinas are produced by counterfeiters. Furthermore, our results lead us to comment on cleaning processes and thei8r consequences for stone at Angkor. Naturally, our work is of modest proportions, but we hope to provide inspiration to researchers with considerable more means than our own. One of the constituent rocks of the statuary and temples of Angkor, arkoses, have a particularly marked alteration fancies, as reflected in the reddish brown patina that is formed on the surface of the rock and which penetrates some millimeters in depth, together with a slight, rounded effect on the sculpted surface. The material's outer features do indeed contribute to assessing the authenticity of objects that are isolated form their context. However, similar features have been found on pieces that have been unquestionably identified as being counterfeits. The purpose of this study is first to describe the major alteration facies of the arkoses of the Angkor temples by examination of sculpture in the J.M. Beurdeley collection and fragments that naturally detached themselves form the temple facades chosen on the basis of their patina or encrustation. Secondly, we study the "patina" appearing on a counterfeit sculpture. 1) An analysis with a polarizing microscope on thin section specimens. The purpose of this analysis is (a) to characterize the rock in petrographic terms (major and accessory minerals, mineralogical phase alteration) and (b) to understand the process of patina formation. Patina formation was observed on the surface of the rock by the nature of the deposits reflected in altered surface color, by their distribution on the rock, and by the various mineral phases as compared with the internal areas with no patina. 2) An analysis with a scanning electron microscope (SEM) for the purpose of (a) visualizing the types of mineralogical phase alterations and specifying the nature of the deposits forming the patina and (b) studying the distribution of certain minerals inside the rock, from the patina down to the "sound' area. Our procedure was to produce "X-ray images" which map the distribution of elements such as iron, manganese, calcium, etc. each white dot of the X-ray images represents the presence of the element. Consequently, a cluster of dots indicates a concentration of the element in that spot. The arkoses used for building the temples of Angkor, and for the statuary, associate quartzes with alkaline and plagioclase feldspars and white and black micas. The rock shows undulatory extinction of the quartzes and feldspars. In addition to these major minerals, there are many accessory minerals too (in order of their significance: epidote, barite, zircon, sphene). The various minerals are cemented by clays (kaolinite, chlorite) and late-formed quartzes, associated with iron oxides and titanium. Calcite sometimes appears as filler in the interstices. In all cases, alterations of varying degrees may be observed deeper inside the rock, in the plagioclase feldspars (damouritization, kaloinization) and micas (chloritization). These alteration processes are sometimes concurrent with individualization of iron oxides, which can cause the intergranular cement to become ferruginous. Many of these alterations can be attributed to ancient processes that occurred before the rock was quarried and sculpted. The patina is the result of the combination of physico-chemical and biological processes. The physico-chemical processes produce an accumulation of iron oxides and manganese oxides on the surface of the rock, sometimes as two superposed strata (1) an inner black layer of manganese oxide forming a border with the "sound" rock. The invasion of the surface of the rock partly arises when the clay phases of the intergranular cement become ferruginous and partly through the accumulation of iron oxides and hydroxides and of manganese oxides in the int4erstices, which in some cases they fill up completely. For these two phenomena to occur, accumulation and ferruginization, the products of alteration of the minerals deep inside the rock must be drained out to the surface by water circulating through the rock. A phase during which these products are recrystalized is also necessary in connection with the cycles of moisture and drying on the outer surfaces of the sculptures and walls. In the top layer, the more fragile mineral phases (the feldspars) have undergone more pronounced alteration together with the formation of iron and manganese oxides and hydroxides deriving no doubt from more active drainage at the surface due to rainwater. This activity eliminates the most altered phases producing the rounded, spotted appearance of the surface. The role of living organisms (moss, fungi,algae, lichen, bacteria0 in the breakdown of mineral phases is extremely important. They are active in chemical processes that dissolve the mineral phases and in mechanical processes. The specimens examined showed the extent of the mechanical alteration, whereby plant material gradually penetrates between the rock crystals into the mineral phases progressively causing them to crack. Two cases observed were of particular interest. In one case, the plant phases are closely associated with the iron oxides in the outermost part of the patina. These oxides appear to hinder the penetration of the plant filaments. Intergranular cracking is observed and the infrequent porosity in the patina are filled with plant material. In the other case, the absence of iron oxide deposits on the surface allows biological degradation processes to occur unhindered causing significant intergranular cracking that lays bare the mineralogical phases down through a few tenths of a millimeter. The plant material can also form "encrustation" of layered organic material. To sum up, the natural patina formed on the arkoses used for the statuary and construction of the temples of Angkor is the result of a dual, antagonistic process of induration and erosion of the rock surfaces. The induration is a physical-chemical process whereby the iron and manganese oxides accumulate on the surface layer of the rock. It produces the reddish brown color of the patina typical of the roofs of the Angkor galleries. Surface erosion arises from a series of factors, physico-chemical ones (more intense alteration of the mineral phases on the surface), mechanical ones (ablation of the mineral phases weathered by surface water) and biological ones (intergranular cracking and mineral phase breakdown). 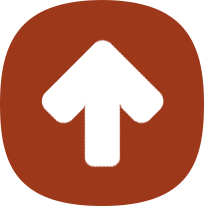 This produces the rounded, spotted effect on the surface. Counterfeit patinas are generally obtained by the application of colored mineral (clays) or organic substances (dyes, resins) to the rock surface. In many cases, the color and the rounded effect on the surface are not obtained concurrently and coloring is highly superficial. We observed a case of a more complex counterfeit patina that was acceptable on both of the above counts and penetrated to an appreciable depth (around one millimeter) as exhibited on a fracture. The specimen studied was the head of a statue acquired in Southeast Asia form a counterfeiter sculpted in an arkose whose general petrography characteristics were the same as those of the sculpture and fragments considered ancient previously examined. Examination of a section of the rock used for making the stature reveals a red "patina" of variable thickness (1 to 3 mm) but with a very straight boundary as opposed to other patinas. A slightly discolored area approximately 2 mm thick appears beneath the outer red layer. The "sound" rock is grayish brown reflecting slight intergranular coloration by iron oxides. 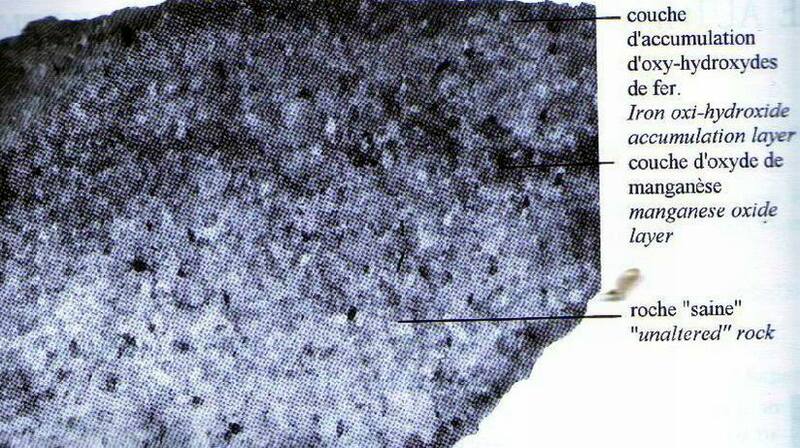 Thin section examination of the "patina" area shows up a diffuse impregnation of the mineral grains and the intergranular cement by iron oxides that do not from clearly defined masses. In the discolored area, almost no iron oxides are found. Examination of the area with no "patina" reveals the presence of iron oxides and hydroxides in the form of intergranular deposits associated with the clays that constitute the rock cement and also in the form of peripheral deposits of intergranular calcite that is particularly abundant in the arkose. The X-ray images of the distribution of chemical elements confirm this observation as to the distribution of iron. It also shows up the absence of calcium in the patina area and the discolored area immediately beneath it, which in petrography terms indicates that the intergranular calcite has disappeared. The relationship between the artificial patina and the disappearance of calcite prompts us to hypothesize that the "patina" is the result of an acid attack on the surface of the rock, which selectively breaks down the calcium carbonates while releasing the iron oxides. 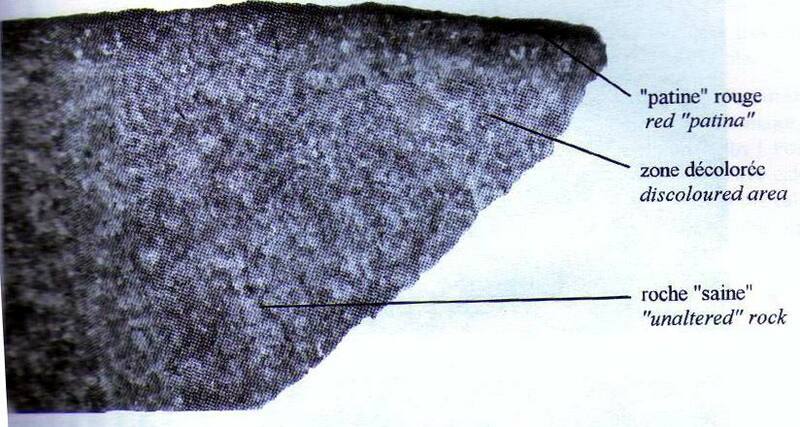 Acid treatment of this type leads to: (1) increased porosity in the rock which can produce an irregular surface with a more granular surface and (2) uniform coloring of the first, few millimeters subjected to the acid attack which is the result firstly of iron oxide breakdown over a few millimeters in depth (the discolored area beneath the red layer) and then of recrystallization in the external part when the rock surface dries (outer red layer). To verify this hypothesis a drop of dilute hydrochloric acid was deposited on a fragment of "sound" rock and kept in a hot, humid atmosphere for a few hours. When dried, a red "patina" similar to that observed on the head examined had formed. This process for producing a counterfeit patina has been successfully tested on several fragments sampled form other sculptures. Naturally, the result is variable in terms of coloring depending on the iron oxide and hydroxide content of the "sound" rock and in all cases is fairly superficial. However, if the material is highly sensitive to acid attack due to the presence of significant amounts of calcium carbonate, as was the case with the specimen studied, the counterfeit patina penetrates deeply and is well developed. The arkoses in the temples and statuary of Angkor present a number of mineralogical features that sometimes give rise to a characteristic, reddish-brown ferruginous patina. In this study, we describe a technique for producing a counterfeit patina which makes use of these petrographic features of arkoses: (1) presence of iron oxides in the "sound" rock that can be caused to migrate under the effects of acids and (2) presence in some cases, no doubt the most favorable for producing counterfeits, of intergranular calcite. (1) The ferruginous film constituting the patina appears to play a significant role in protecting the rocks from biological alteration processes. In the absence of patina, the development of these processes is spectacular. Hence, when cleaning the surface of the stone, it would seem necessary to try and preserve this natural protective coating as much a possible. (2) The existence of arkoses containing intergranular calcite may explain the major stratified fractures in temples, attributed by J>Pochon, et al. To the development of expansive calcium sulfate. Calcium sulfate forms from the calcium carbonate present in the rock and the organic sulfur in humus and animal excreta (bats, birds). It would be of great interest to verify that there is actually a correlation between these areas with major fractures and the presence of arkoses containing intergranular calcite. If the correlation exists detailed petrographic identification would perhaps be a means for staking out the areas where there is a major risk of alteration that might require specific restoration treatment.